Most people in the Labour Party are delighted that instead of a Nick Cohen meltdown [Don’t tell me you weren’t warned about Corbyn] Labour under Jeremy Corbyn’s leadership gained over 40%, the highest vote since 2001 and the largest increase of any party since Attlee in 1945. I said most people, not all people. Even sections of the Right, Owen Smith, Chuku Ummuna and even Peter Mandelson paid tribute to Jeremy Corbyn and ate generous helpings of humble pie. However there were some people who were bitterly disappointed. They had been hoping to launch a volley of venomous attacks on ‘Corbyn the loser’ as soon as the polls closed. 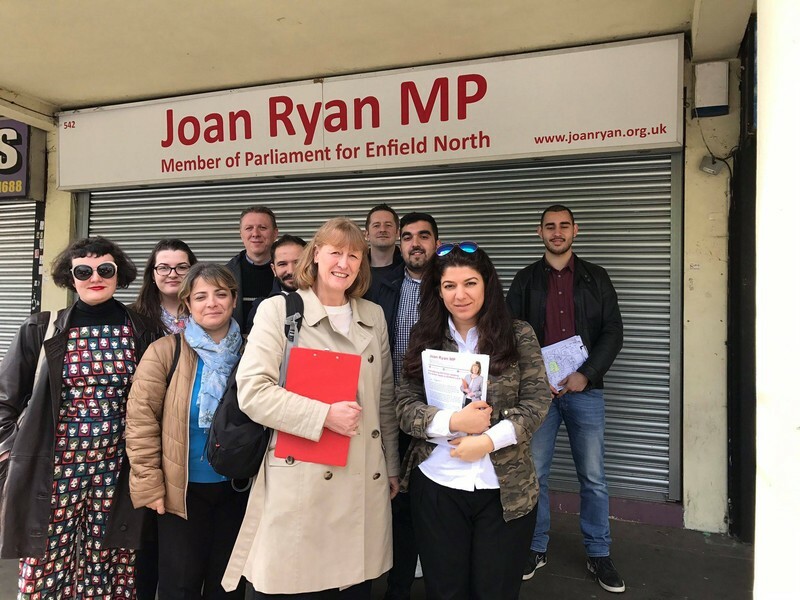 People like Joan Ryan MP, the Chair of Labour Friends of Israel had made it clear during the election that she preferred pro-Zionist Theresa May to Corbyn. Jeremy Newmark, the Chair of the Jewish Labour Movement and the defeated candidate in Finchley and Golders Green, must have gone to bed a bitter and disappointed man. All his good work undermining Corbyn had been undone at a stroke by this youth rebellion. 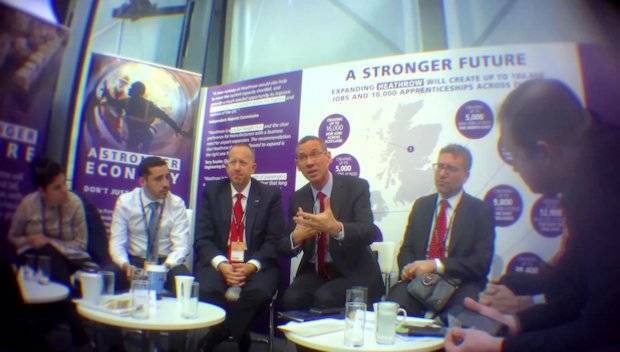 Labour Friends of Israel and Jewish Labour Movement MPs and candidates consistently attacked Jeremy Corbyn during the election campaign and said vote for them despite Corbyn. Not just the execrable Joan Ryan but Hove’s Peter Kyle, Wes Streeting and Jeremy Newmark. 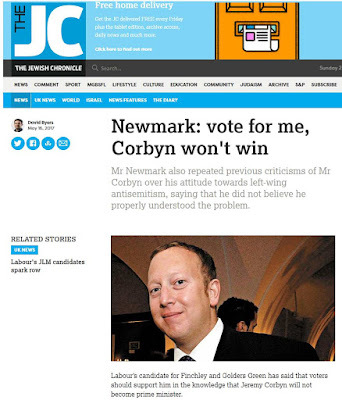 Loyalty to Apartheid Israel is far more important to them than a Labour win in Britain. Things have gone quiet on the ‘anti-Semitism’ front of late. What with the General Election and the terrorist attacks and now the awful tragedy of the Grenfell Tower, the fake ‘anti-Semitism’ campaign has gone quiet. 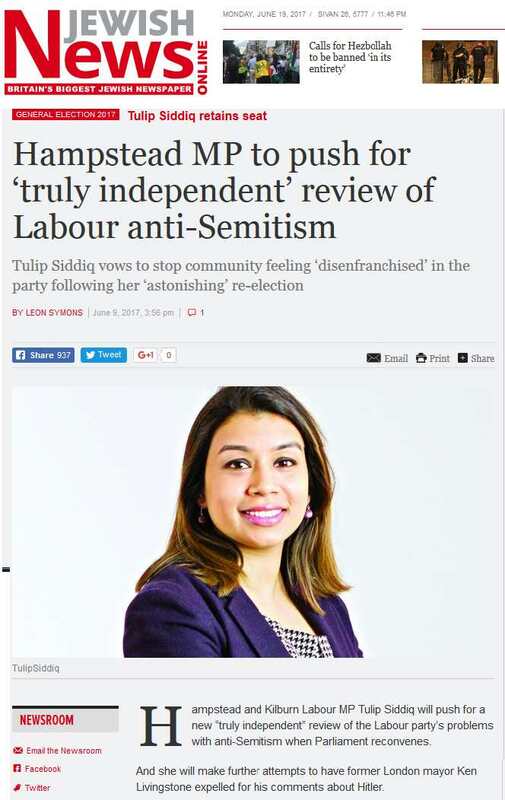 We haven’t even had any news about ‘Labour anti-Semitism’. I no longer have to look over my shoulder before going out in the morning in case someone is about to attack me! Unlike the atrocious attack on Finsbury Road mosque and the massive increase in Islamaphobic attacks in the wake of the recent terrorism attacks, Jews have it pretty good. 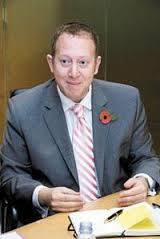 They are a small, relatively prosperous white minority. Anti-Semitism is a marginal phenomenon, which exists mainly on social media where one nut can create a storm. When anti-Semitism was a problem in Britain, in the 1930’s and immediately after the war, then it was the same Tories who today love Israel who barred Jews from their golf clubs and believed they were an alien minority. 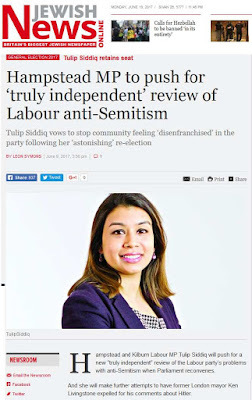 It is because of the lack of real anti-Semitism that the Zionist lobby has decided to try and rekindle the false and fake ‘anti-Semitism’ campaign. Zionism has no problem with genuine anti-Semitism. On the contrary it has historically welcomed it because without anti-Semitism there would not have been enough immigrants for Israel. 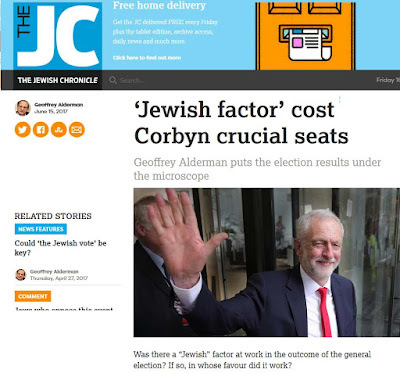 The Jewish Chronicle edited by ex-Express editor Jonathan Pollard, is up to its old tricks - Jeremy Corbyn is apparently a liability.